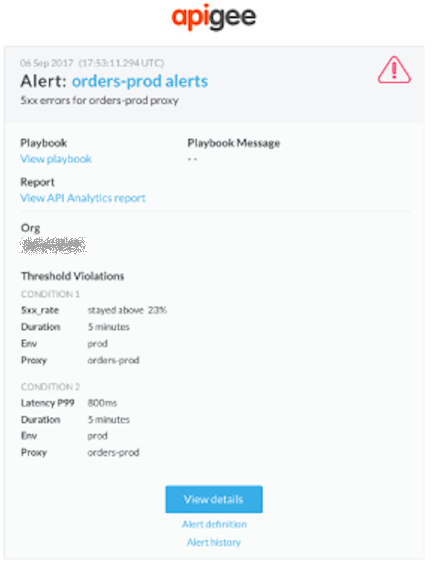 Alert conditions define specific status code (for example 404/502/2xx/4xx/5xx), latency, and fault code thresholds that when exceeded trigger visual alerts in the UI and send notifications through a variety of channels, such as email, slack, pagerduty, or webhooks. You can set up alerts at the environment, API proxy or target service, or region level. When an alert is triggered, you will receive a notification using the method you defined when adding alerts and notifications. Note: You can set up a maximum of 20 alerts per organization. The alert settings apply to all users in the organization; they are not per user. If you change the alert settings, they change for all users in your organization. For example, you may want to trigger an alert and send a notification to the Operations team when the 5xx error rate exceeds 23% for a period of 5 minutes for the orders-prod API proxy deployed to your production environment. The following provides an example of an email notification that you may receive when an alert is triggered. View details to view more details, including the alert settings and activity for each condition over the last hour. Alert definition to view the definition of the alert. Alert history to view more information about the particular alert. View playbook to view the recommended actions, if provided. View API Analytics Report to view a custom report for the alert condition. The following sections describe how to set up and manage alerts and notifications. 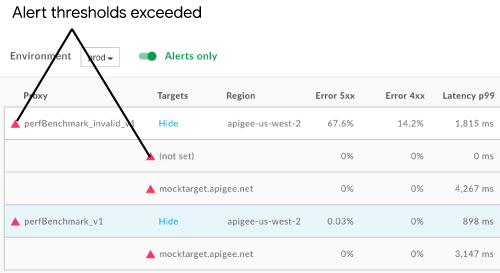 To view alert settings that are currently defined, click Alerts on the API Monitoring dashboard. To view the full history of alerts that have been triggered for your organization, click Alerts on the API Monitoring dashboard and click the History tab. The Alert History page is displayed. Click the name of the alert to view the details of the alert in the Investigate dashboard. You can filter the list by searching on all or part of the alert name. Click Alerts on the API Monitoring dashboard. Alert Name Name of the alert. Use a name that describes the trigger and that will be meaningful to you. The name cannot exceed 128 characters. Description Description of the alert. Environment Select the environment from the drop-down list. Status Toggle to enable or disable the alert. Define the metric, threshold, and dimension for the first condition that will trigger the alert. All - Combined total across all fault codes in this category/subcategory must meet the metric criteria. Any - Single fault code in this category/subcategory must meet the metric criteria. See Fault code reference for more information. Latency: Select a latency value from the drop-down list. Specifically: p50, p90, p95, or p99. Status Code: Select a status code from the list, such as 401, 404, 2xx, 4xx, or 5xx HTTP from the list. Note: For rate limiting alerts (HTTP status code 429), set the metric to a Spike Arrest fault code. Note: In Apigee Edge, you can use the Assign Message policy to rewrite the HTTP response code, either from a proxy error or a target error. API Monitoring ignores any rewritten codes and logs the actual HTTP response codes. Fault Code: Set the threshold as a percentage rate, count, or transactions per second (TPS) over time. Latency: Select the threshold as a total or target latency duration (ms) over time. In this case, an alert is fired if the specified percentile observed latency, which is updated each minute if traffic is present, exceeds the threshold condition for the timespan covering the specified time duration. That is, the threshold condition is not aggregated over the full time duration. Status Code: Set the threshold as a percentage rate, count, or transactions per second (TPS) over time. Dimension Click +Add Dimension and specify the dimension details for which to return results including the API proxy, target service, or developer app, and region. All - All entities in the dimension must meet the metric criteria. You cannot select All for a metric of type Latency. Any - Applicable to region only. An entity in the dimension must meet the metric criteria for any single region. Note: For API proxies or target services, select a Collection to support Any functionality. Collections - Select a collection from the list to specify the set of API proxies or target services. In this case, any entity in the collection must meet the criteria. Click Show condition data to show recent data for the condition over the last hour. The error rate in the graph displays red when it exceeds the alert condition threshold. Click Hide condition data to hide the data. Click + Add Condition to add additional conditions and repeat steps 4 and 5. Note: If you specify multiple conditions, the alert will be triggered when all the conditions are met. Click Create an API analytics reports based on alert conditions if you want to create a custom report based on the alert conditions that you configured. This option is greyed out if you are not an organization administrator. For more information, see Create a custom report from an alert. Note: You can modify the custom report after you save the alert, as described in Managing custom reports. Click + Add Notification to add an alert notification. Channel Select the notification channel that you want to use and specify the destination: Email, Slack, PagerDuty, or Webhook. Note: You can specify only one destination per notification. To specify multiple destinations for the same channel type, add additional notifications. To add additional notifications, repeat step 8. Playbook (Optional) Free-form text field to provide a short description of recommend actions for resolving the alerts when they fire. You can also specify a link to your internal wiki or community page where you reference best practices. The information in this field will be included in the notification. The contents in this field cannot exceed 1500 characters. Throttle Frequency with which to send notifications. Select a value from the drop-down list. Valid values include: 15 minutes, 30 minutes, and 1 hour. When creating an alert, click Create an API analytics reports based on alert conditions, as described in Adding alerts and notifications. Alert alertName saved successfully. To customize the report generated, click here. In the Reports column, click the custom report associated with the alert that you want to manage. The custom report page displays in a new tab. If the Reports column is blank, a custom report has not yet been created. You can edit the alert to add a custom report, if desired. Click the toggle in the Status column associated with the alert that you want to enable or disable. Click the name of the alert you want to edit. Edit the alert, as required. Position the cursor over the alert you want to delete and click in the actions menu. Note: If you created a custom report when you created the alert, then deleteing the alert also deletes the custom report. For more information, see Create a custom report from an alert. Apigee recommends that you set up the following alerts to be notified about common issues. "faultCodeCategory": "Gateway", "faultCodeSubCategory": "Target", "faultCodeName" : "Gateway UnexpectedEOFAtTarget"
The following provides an example of how to set up an alert using the UI that is triggered when the transactions per second (TPS) of 5xx status codes for the hotels API proxy exceeds 100 for 10 minutes for any region. For more information, see Add alerts and notifications. For information about using the API, see Set up a 5xx status code alert for an proxy using the API. The following provides an example of how to set up an alert using the UI that is triggered when total response latency for the 95th percentile is greater than 100 ms for 5 minutes for the hotels API proxy for any region. For more information, see Add alerts and notifications. The following provides an example of how to set up an alert using the UI that is triggered when the percentage of 404 status codes for all API proxies exceeds 5% for 5 minutes for any region. For more information, see Add alerts and notifications. For information about using the API, see Set up a 404 (Application Not Found) alert for all API proxies using the API. For information about using the API, see Set up an API proxy count alert for mission-critical APIs using the API. For information about using the API, see Set up an error rate alert for mission-critical target services using the API. For information about using the API, see Set up a fault code alert for mission-critical APIs using the API.